Global M&A value in the first three quarters of 2014 exploded to US$2.5tr up 52% from US$1.7tr last year, according to Mergermarket. That points towards returning to the M&A boom levels of 2005-2008. At the peak of that, global M&A value reached $3.7 tr. (M&A surge in Q3 2014, back to precrisis levels). US represent around half of global activity with M&A value edging towards US$1.2 tr in the first nine months of 2014, already over the US$965 bn for the whole of 2013 according to Mergemarket and reaching towards 2007-8 territory. Most of the increase has been fueled by the return of mega deals, ie those over $5bn. Middle market deals although not following the same explosive pattern, grew as well. 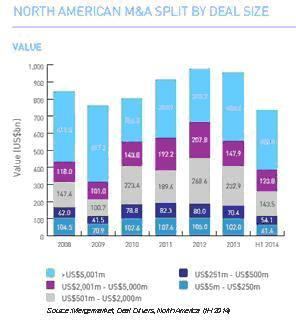 North American M&As between $250-$500m reached $54m during the first half of 2014 compared to $70m in all 2013. At the lower bracket $5-250m, M&A value reached $61m in the first half of 2014 compared to $102m for full year 2013. 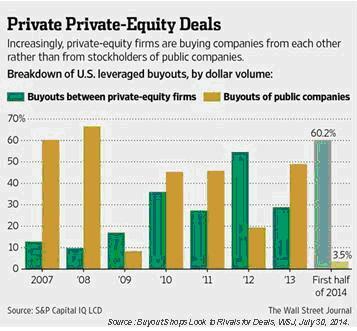 Activity in the private equity space has lagged behind that of the overall M&A market. The first half of 2014 saw 432 buyouts in North America for US$80bn total worth. That was a 13% decrease from first half of 2013 (US$92bn) according to Mergermarket. Private equities, contrary to the past have stayed away from large LBOs and instead turned their attention to middle market and exiting past investments. Middle market matters: According to the U.S. Census, there are 360,000 middle size companies in America (with revenues between $5m – $1bn), 95% of which generate less than $100m but a large number of jobs. Mid-size companies increased revenue by 7.5 percent in the third quarter of 2014, compared with 5.5 percent for Standard & Poor’s 500 Index, according to the National Center for the Middle Market. According to Robert Slee, a researcher specializing in this area, 75% of middle size companies destroy value as they usually produce returns below their cost of capital (The New Math of Middle Market M&A, Robert Slee The Value Examiner, July/August 2009). Hence there’s significant potential for growth and value creation. PEs get increasingly involved in this space and own around 10% of mid size companies, usually the top performers. Middle market definition varies by region: Transactions involving middle market companies are considered those below $1bn in value, and more often below $500mn. Actually a good reference point are deals between $250-$500m and at the lower end between $100-$250m. That is according to US standards. Average deal sizes in Europe and Asia are almost 50% below those in the US. Therefore a deal considered middle market or even small by US standards might be a mega deal in the context of a cross-border transaction and by that attract much more attention from local regulators and communities. Therefore, it has to be approached with increased level of diligence and sensitivity, reminiscent of that for mega-deals. Well experienced M&A advisors can make all the difference in these situations. Success is not straightforward in midmarket: Although the large number of targets and potential for value creation, it’s not easy to score a home run. Companies are often the extension of their owners’ lifestyles and not clearly distinguishable and investable (Private Equity 2013 Update and Success Factors for Value Realization). So PEs often pass. In other occasions certain PEs will be the first time investors that professionalize a company and then sell to a more experienced PE to scale up the businesses. Other difficulties arise from inefficiencies in locating interesting deals, limited attention span, liability risk, and high pricing. So often advisors and PEs complain that many good deals fall through the cracks. Mega deals fall from grace: PE firms have shined away from the large LBOs of the past. These deals have not faired that well. It’s often difficult to navigate through larger organizations and especially when through a consortium that adds inflexibility in decision making (Large Private Equity Deals-that 800 pound gorilla). At the same time valuations got high during the 2006-2008 boom years. Some notable unfortunate investments included bankrupted utility TXU, Caesars and Freescale (Private equity’s mega-deals: Too big to veil, What All Mega-Buyouts of the Mid-2000s Have in Common). Exits: Not surprisingly, much of recent PE activity has turned into exiting older investments. This is not that easy. According to Mergermarket, PE firms are having difficulty to recoup boom-era investments (EMEA Deal Drivers 1H2014). Because of that, holding periods have increased to six years compared to around three in 2007 (PE Market Update 2013). Secondary offerings are the most common form of exit nowadays, a change from the IPO heavy past, and represent a large part of middle market transactions as well. Seventy-three percent of PE managers in a 2014 poll expected to exit investments through secondary buyouts in the next year. More than half of respondents expected the industry to sell to a strategic buyer, with 39% choosing IPOs (Global Private Equity Outlook 2014-2015, Duff&Phelps, Shearman &Sterling, Mergermarket). Midmarket, growth focus: Private Equity’s new strategy is investing independently in mid size companies with hidden value and companies with growth potential. The bulk of buyouts are valued at less than US$100m. Eighty-three percent of private-equity firms in the first half of 2014 made deals involving middle size companies, the highest percentage since at least 2005, according to PitchBook. (Carlyle said to seek $2 Billion for Mid-Market LBO Fund). Forty PE growth/expansion funds closed in 2013 collecting more than $9 billion in commitments (The Rise of Growth Deals: Another PE Model for a Post-Crisis World). Furthermore, Business Development Companies who mainly invest/finance middle size companies are becoming more popular. There are 54 BDCs today with $56.5 bn in assets from just three with $2.2 bn in 2000 (As More Capital Is Available To Middle Market Companies, M&A May Heat Up). M&A Industry focus: much about niches. Certain sectors are more represented in middle market M&A such as consumer products, business services and manufacturing, while mega deals are more concentrated around healthcare, energy and tech, even though mid size deals also take place involving niche players. Private Equities in particular focus on consumer, TMT, biotech and subsectors in industrials, business services and technology. Notable PE transactions this year: Red Lobster’s acquisitions by Golden Gate Capital ($2.1bn), First Data’s by KKR ($3.5bn), Ortho-Clinical Diagnostics’ and Industrial Packaging Group’s by Carlyle for $4.2bn and $3.2bn respectively (Preqin Quarterly Private Equity Update 1Q, 2Q 2014). Middle market valuations rising: As middle market deals grow in popularity there’s increasing competition between buyers, be it PE firms or strategic investors and hence valuations are rising (with corporate acquirers having the advantage of synergies). This reduces the number of desirable targets and deals are becoming more expensive. Multiples (EV/EBITDA) for the $50-250m bracket went from 6.5 in 2010 to 8.5 in 1Q2014 another sign of increased market activity (Axial Forum, Valuation Inflation: Middle Market Multiples on the Rise, John Slater, Focus Investment Banking, July 9, 2014). Multiples in larger middle market transactions ($500m to $1bn) have risen to 12x in 3Q14 according to Factset (US M&A Trends & News Oct 2014). Future PE trends and the middle market: Even though the loss of spotlight to mega deals, the overall trend is positive. PE managers polled by Mergermarket expect increased activity in 2014-15 (Global Private Equity Outlook 2014-2015, Duff&Phelps, Shearman &Sterling, Mergermarket). On average, cross-border transactions are expected to make up 30% of activity. Main drivers will be consolidation, changing demographics and consumer tastes, technology, debt financing, PE exits, globalization and value creation. Success planning will create a wave of liquidity events as baby boomers that own mid size companies will retire. At the same time, although the consumer sector is cautious there’s always creative destruction and opportunity from new products. For example the Greek yogurt mania in the US created a new segment with explosive growth in less than ten years with a startup, Chobani, being the market leader. Finally, technology is creating ample startup opportunities. Dry powder is at record levels but is not for free. The amount of available capital for Private Equity investment hit a record high of $1.14 tr in June 2014 globally, even higher than in 2006-2008, according to Preqin (Private Equity Has More Than It Can Spend). However the landscape has changed. PE deals are becoming more competitive and considering some boom era failures, managers have to prove their merits by bringing returns. Working only through sourcing inefficiencies, financial engineering or IPO exits are not enough to generate alpha. 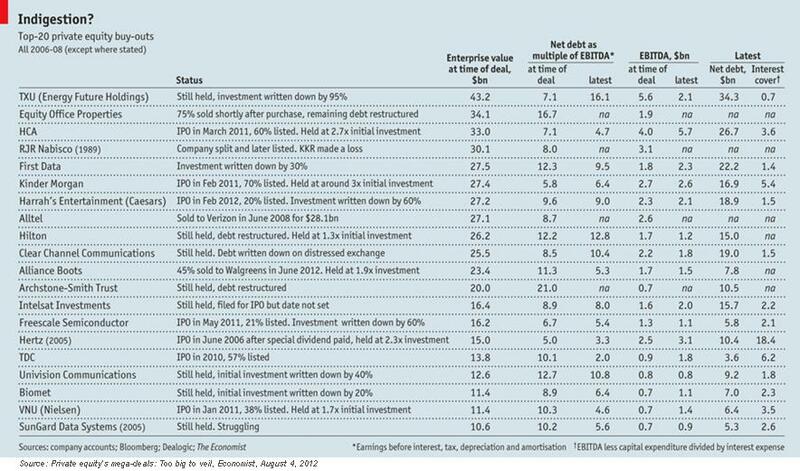 Value creation has become more important (Private Equity 2013 Update and Success Factors for Value Realization). In this sense a secondary offering might make sense when the buyer has experience in a particular sector. Actually there’s even talk about outright acquisitions of PE firms as well. PE regulatory pressures and fair value adjustments: Another interesting development over the last years is that private equity companies now have to fair value their portfolios on a continuous basis for reporting purposes. According to SFAS 157 (a.k.a. ASC 820) under US GAAP as well as IFRS 13 under International Accounting Standards these equity investments should be recorded at market values, when listed or based on comparables listed companies if not and in the absence of both conditions on financial modeling. PE managers were not used to this level of scrutiny in the past. This, apart from creating a lot of work for valuation professionals and back offices, it is also a source of frustration for deal makers who now have to support book values many of which were made under better times. But it also adds transparency. This entry was posted in Financial Markets, M&A Markets and tagged Middle market. Bookmark the permalink.